UPDATE: The club has raised in excess of £4,000 for Save the Children since 2012. As we start the 2018 season, we will continue to raise precious funds for Save the Children. We are extremely pleased to announce that we will be supporting Save the Children for the seventh year running in 2018. Save the Children is an international children's charity based in the UK, which supports both emergency and long-term relief projects around the world. 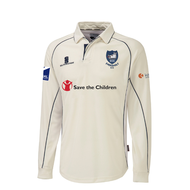 Following a personal donation to the Club, we have sacrificed the main advertising space on the front of our new Junior and Senior match shirts to display the Save the Children logo. In addition, over the next two years we'll also be coordinating a series of fundraising events to raise precious funds for Save the Children. We'd like to take this opportunity to thank our donor, Iqbal Anjum, Consultant Urologist at Milton Keynes General Hospital. Iqbal was involved in devising this charitable proposal from the beginning, and helped in choosing Save the Children as our charity sponsor. He chose to work with Eversholt Cricket Club in order to raise the awareness of Save the Children at nearly 700 matches over a five-year period. For every £1 that the Club raises during our Save the Children campaign, Save the Children will use 88p to benefit children and use the remaining 12p to raise the next £1. What is Save the Children doing right now? Training thousands of health workers to reach out into Ebola-hit communities in West Africa. Started 'Born to Read' which gives poorer children in the UK the reading skills they need for a better future. Making sure the poorest 10% of children in Ecuador get a better education and are protected from abuse. If you'd like to, you can donate to our Save the Children campaign at any point by using our online JustGiving page or text donation service. You can also donate any spare change by dropping it into a collection bucket at the clubhouse. Donate online: http://www.justgiving.com/eversholtcricketclub - you even have the option to claim Gift Aid so that Save the Children receive an extra 25% on top of your donation for free! Donate by text: Just text EVER98 £1 to 70070 - you can donate the following amounts: £1, £2, £3, £4, £5 or £10.